A valuable explanation of the leading theologies of the last 175 years. Contemporary Theology: An Introduction: Classical, Evangelical, Philosophical, and Global Perspectives came at just the right moment for me. I have been trying to grow as a pastor-theologian, doing more strategic theological reading and deeper theological thinking, but I keep feeling like I’m missing some crucial foundational knowledge. I already have three degrees in Bible and theology, but I still often feel like I’m playing catch-up when some theological controversies pop up on the radar. So in January, just when I was planning out my reading strategy for 2019, Scot McKnight blogged about this new book by Kirk MacGregor that concisely summarized all of the prevailing theologies of the modern period. 'Yep, that's what I need" I said as I pushed "Add to Cart." I’ve been reading one chapter in a sitting several times a week (just 5-9 pages each), so it’s taken me about 3 months to work through the 38 chapters. I had heard of the subjects of each chapter, but I wasn’t super familiar with all of them. 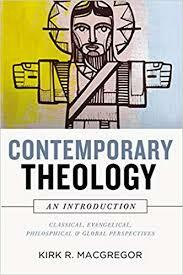 Before reading Contemporary Theology, I couldn’t have explained the big ideas of many of the theologians of the 20th century such as Barth, Bultmann, Tillich, Moltmann, Pannenberg, Rahner, Yoder, Cone, Plantiga, and dozens more. I had been introduced to many many of them back in seminary and had to read some of their works, but today, I couldn’t have explained their thoughts to someone curious. Now having read the book, I still probably couldn’t explain those big ideas to the satisfaction of their leading proponents, but I believe that those leading proponents would be very satisfied with MacGregor’s explanations. He has a knack for capturing and restating the deep thinking of deep thinkers. MacGregor tries to keep his opinions to himself. For the most part, he doesn’t offer his own evaluations of these diverse theologies, attempting mostly to help people grasp what the idea is, not whether or not it’s a good or right idea. At times, he can’t really help it, and his own admiration for a particular position, argument, or theologian seeps through (and sometimes his disdain for one does, too). That’s not really a weakness. In fact, I enjoyed reading between the lines to guess at what his theological proclivities are. I also thoroughly enjoyed the parts where several of my own professors showed up as key movers and shakers in the story. I’m really glad I read Contemporary Theology. It was a refresher course (also now available as an actual video course) in theological movements that have shaped the time period in which I have lived. I’m sure I will refer back to it many times as I continue to grow bit-by-bit as a pastor-theologian. “Oh yeah, that’s what that theologian taught!” Recommended.